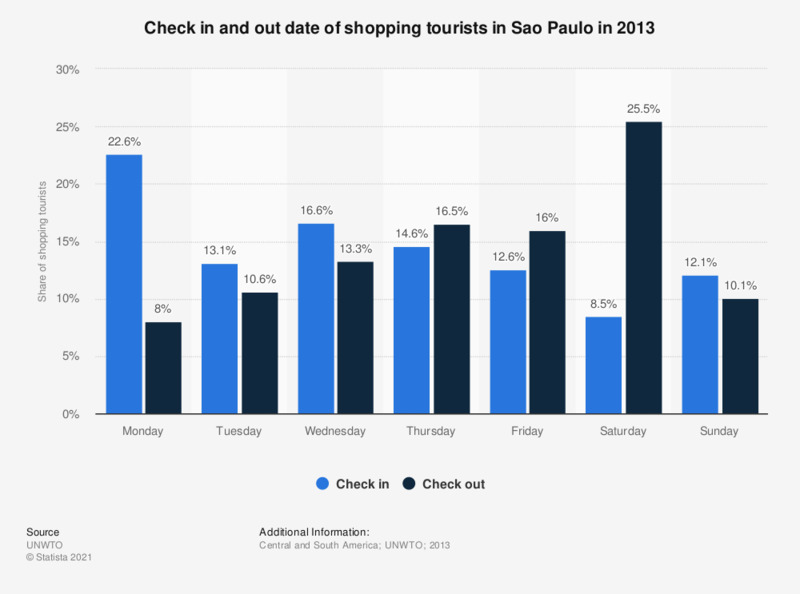 This statistic shows the check in and out dates of shopping tourists in Sao Paulo in 2013. The most popular day for shopping tourists to check in was Monday and the most popular check out date was Saturday. How welcoming would you say that locals are to tourists in the following U.S. cities? Which of the following have you actually seen a tourist do or wear in your city? Which of the following ways do you prefer to get driving directions when traveling (either to a city or within it)? Which of the following tourist “clichés” are you guilty of? What expenses are you planning to make in 2017? Which of the following would you consider the best indications that you have succeeded in blending in to a city you are visiting? How much are you going to spend on travel in 2017 compared to 2016? Who would you consider your travel icon or role model? What is your favorite thing about tourists? Can you tell if someone is a tourist in your city just by looking at them?